Manufacturer warrants the vehicle will be free of defects in materials and workmanship at Delivery Time. A Qualified mechanic must uncrate, perform final assembly, setup, adjustments and oil service at his/her own expense (even on assembled units). Labor is not covered under any circumstance and no credit will be issued. A copy of the mechanic’s assembly invoice is required for any warranty coverage. Missing or broken items noted at Delivery Time will be replaced free of charge under Manufacturer Warranty. 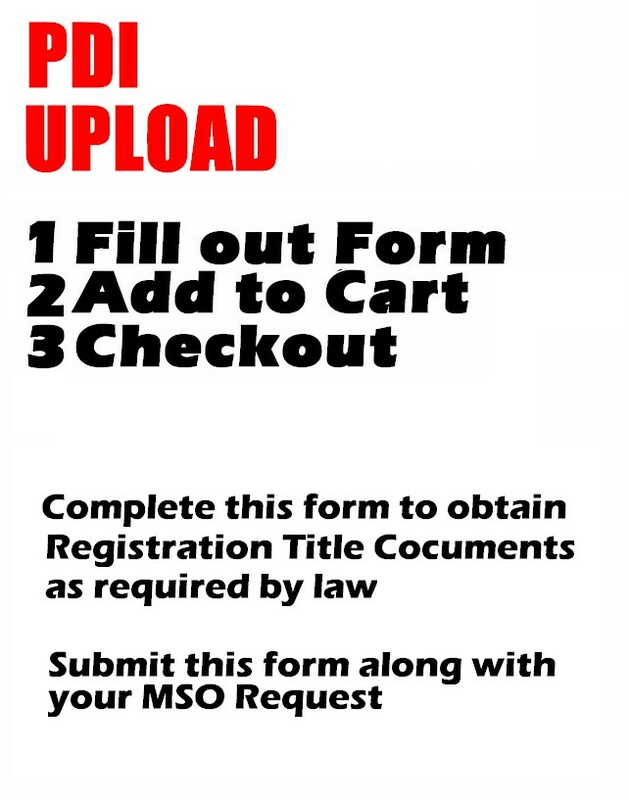 Customer must inform us within 3 days of delivery by completing a Help Request on our website. Customer must complete a Help Request and return any defective parts to us for inspection before any replacement will be sent. Damage due to operation, accidents, improper assembly, improper maintenance are NOT covered under warranty. 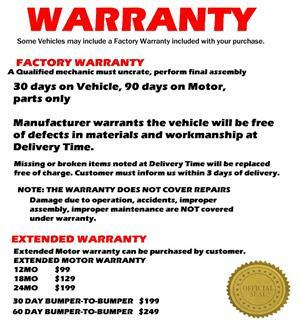 Extended Motor Warranty can be added on the vehicle product listing. The Motor Warranty can be extended beyond 90 days. AN ENGINE FAILURE CAN BE REPAIRED OR REPLACED under warranty during the specified period. Warranty coverage does not apply to routine service, maintenance or repair of the vehicle, or damage during operation, mis-use, improper setup or maintenance. Upon receipt of your part/motor, we will inspect, issue a report and estimate of repair or replacement cost. If the engine is deemed to be defective, the cost or a portion thereof may be covered under warranty. If the engine is not defective, then the customer will have the option of paying for the repair or replacement of the engine. The engine can be returned to the customer, un-repaired upon payment of the shipping charge by customer. Engines not repaired may be discarded, retained for use, or otherwise disposed of if return shipment charge not paid by customer within 30 days of email notification. Defective parts must be returned to us at Customer’s expense, for inspection before a replacement part will be sent. Parts sent back will be inspected and a report will be issued to customer including an estimate of repair and/or replacement. If it is determined that the part is defective the cost or a portion thereof may be covered under warranty. If the part is not defective, then the customer will have the option of paying for the repair or replacement of the part. The part can be returned to the customer, un-repaired upon payment of the shipping charge by customer. Parts not repaired may be discarded, retained for use, or otherwise disposed of if return shipment charge not paid by customer within 30 days of email notification. All Vehicles include a standard limited warranty from the manufacturer. This will be indicated on the product listing. Customers can Ask a Question, obtain Technical Assistance or Request Missing or Damaged Parts by completing a Help Request. Gokarts USA will assist the customer in obtaining warranty coverage from the manufacturer if necessary. Upon reviewing your Help Request, our staff may direct you to submit a Warranty Claim Request Customer must ship the defective or damaged part to manufacturer first before a replacement will be sent. Parts returned will be inspected and if deemed defective, will be repaired or replaced at Manufacturer's option. Customer shall be responsible for shipping charges both to and from the Manufacturer. We will contact you with the shipping charge prior to ordering parts under an approved warranty claim. Parts deemed not defective or not covered under warranty shall be discarded or shipped back to the customer upon payment of shipping fee by customer. customer can purchase a part at any time. The factory limited warranty starts on the date that the unit is delivered to the customer. During the warranty period, depending on the model, your warranty will cover parts only and the cost to ship required parts. Warranties do not cover the labor or freight to send back defective parts. Parts are covered under this warranty to be free from manufacturer defects. Parts not included in this warranty are listed below in the Warranty Limitations. Any parts deemed questionable by the manufacturer must be submitted for inspection and approval. A qualified mechanic must perform the initial vehicle set-up and routine maintenance to maintain full warranty coverage. Failure to provide a mechanic’s invoice may void your warranty. *Electrical and Fuel System related warranty claims are limited by the nature of the category. Improper usage and maintenance of electrical and fuel system components may prematurely void warranty. 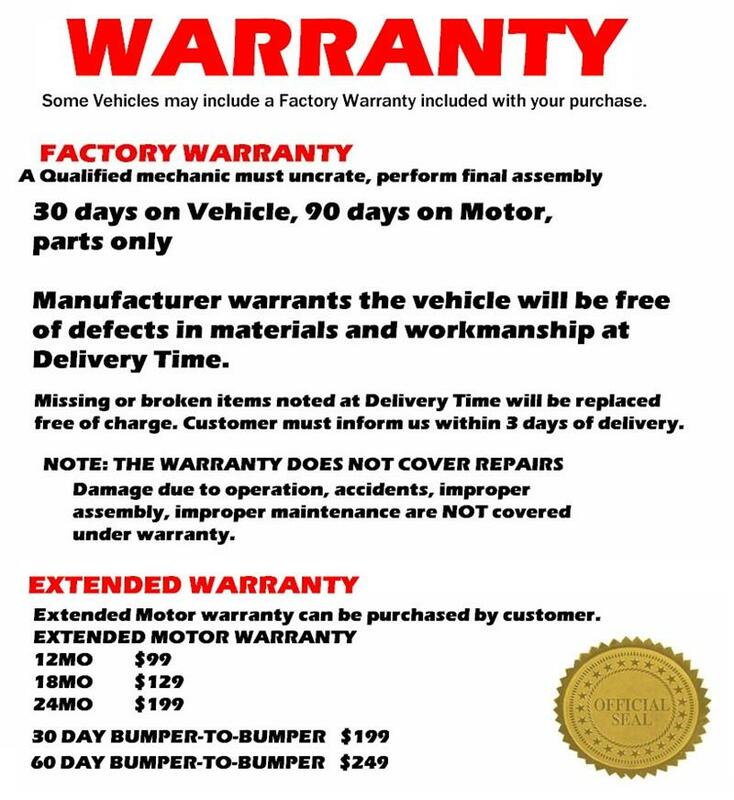 Parts not covered under this warranty are listed below. Warranty requests on any of the below items may be submitted for review to the manufacturer warranty/parts department. If a part is deemed defective by the manufacturer, the part will be covered under Warranty. Unavoidable natural disasters, fire, collision, theft, improper storage or transportation, negligence of the periodic maintenance, improper use, racing, jumping, improper repair, adjustment or maintenance, repairs and adjustments not done by licensed dealers, use of non-genuine parts, using the product for commercial use, unauthorized modification made to the product, operation of the vehicle when it is overheating, or installing performance parts or components on the vehicle that change the original engineering. The Factory Limited Warranty does not cover damage caused by, or resulting from, any other reason besides a manufacturer’s defect. The Customer has 48 hours to report any visible damage to the unit. DO NOT ASSEMBLE THE UNIT UNTIL THE FOLLOWING PROCEDURE IS COMPLETED. GoKarts USA may extend a reasonable allotted time at our discretion for customers with larger orders. 5. Your warranty claim will be declined if the above documents are not provided within the time frame. Upon receiving the above documents, replacement parts will be shipped free of charge. 2. Once approved, the warranty department will instruct you as what to do next. 3. All defective parts must be returned if asked for at the customer’s expense. This cost will be reimbursed to the customer if the part is determined to be defective. 4. A warranty claim will be denied if defective parts are not returned when requested. 5. The Customer is responsible for freight to return the product. If the product is determined to be defective, your warranty will cover parts, factory labor, and freight to send out replacement or repaired components. If the product is determined to be damaged, due to causes other than manufacturer defects, the customer is responsible for parts, factory labor, and freight to send back replacement or repaired product. 1. GoKarts USA is not responsible for shipping delays as it is at will of the shipping company or unpredictable circumstances. 2. The Customer is responsible for any extra shipping cost that occurs after the part has been shipped. This cost includes, but is not limited; to change of address cost, change of zoning cost, re-weight cost, lift gate service. 3. Warranty orders can be canceled before they are shipped. Once a warranty order is shipped, all payment related to such order is non-refundable. If you choose to assemble it yourself, a PDI - Pre-Delivery Inspection and FULL maintenance MUST be done, This is required for ALL units and dealerships in the USA. By Saving the cost of the assembly charge you accept the responsibility to do this. This is a REQUIRED step in the Assembly Process. By not doing this step you will be VOIDING YOUR WARRANTY.